I’ve been thinking about writing a post like this for a long time. But I am no expert on the matter, so I hesitate, then today I was talking to one of my students about it and I thought, “I wanna share.” It is about sleep. I love sleep, I am sure I have said that in a post or two. Sleep is very important to me. I do not function well at all without enough sleep. And really it is also about GOOD sleep. Uninterrupted sleep. I was just starting to get really good sleep and then we got cats. Some of you might know how animals interrupt your sleep. Just this morning, I was awoken, by a small vibrating earthquake, but no, it was one of the cats scratching. I fell back to sleep only to be awoke by another tremor . . . not the earth, a cat violently shaking her head. UGH! Anyway . . . many people have trouble falling asleep. As the conversation went today with my student, she was saying she can’t stop thinking. She has a busy mind. Some call it the monkey mind. What I find annoying is that sometimes even if you aren’t prone to a super busy mind, trying to go to sleep makes it happen. I have a few things I do and a few ideas that might help with that busy bed brain. To me, counting sheep or anything is counter productive. This is how is goes for me: “One, two, three, four, five . . . . twenty-one, oh, I forgot about dinner tomorrow . . . twenty-what? Where was I? Let’s see, I think I was at least at fifteen, but wait, I think that I have been in bed way longer than it would take to get to fifteen . . . ” See how that would not work for me? Once I lose track of the number I am on, then I start thinking again. What does help me, is to just say one word over and over. That way I won’t lose track. I like to say, “Sleep.” I actually just concentrate and repeat it over and over. As other thoughts come up, I say, “Hmmm. Sleep. Sleep. Sleep.” I recognize the thought that tried to interrupt, but then I push it out with my word. Also, sometimes there is a darkness that I can concentrate on. It is as if I am seeing things when I close my eyes, but as I get sleepy it starts to fade and turn to darkness. When a thought comes in, the pictures or light colors come back, but sometimes I can concentrate on that darkness and — boom, I’m a sleep. Sometimes it is a sound. It is like that ringing in the ears. I can concentrate on the sound and it pulls me into sleep. One thing to do during the day that might help when it comes time to sleep, is, not drink caffeine. I know it is a cycle . . . don’t get enough sleep, drink coffee (caffeine), then be up because there is a stimulant in your system. If you are one of those people that thinks they are not affected by caffeine keeping you awake, I would still suggest drinking less. Just SEE what that does to your quality of sleep. Also, what I was suggesting to my student who said she had a busy mind, was dance. 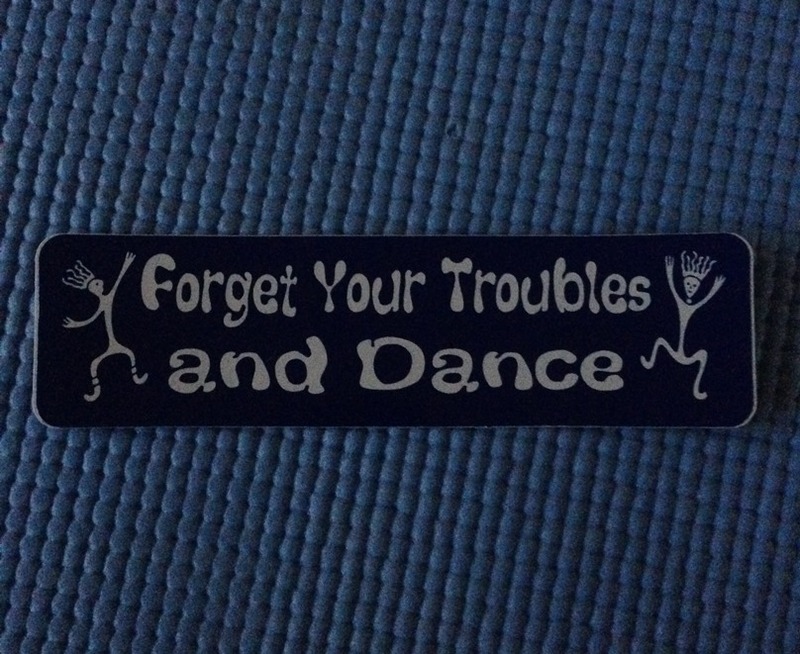 If you like to dance, turn on some of your favorite music and dance to it. Turn on a song you cannot help but move to. Then concentrate on your movements and your body. Basically it is Nia Free Dancing. What this does is it helps you focus. It allows your brain to concentrate so that you can quiet some of the chatter in your head. If you have a monkey mind, it takes PRACTICE to quiet it. So doing this as often as you can will help. Practicing focusing and quieting the brain while you are awake will allow you to quiet it when you want to go to sleep. When you go to bed make sure you are comfortable. Recently I realized that my feet were often cold. I like the room to be cool so I can breath, but my feet were so cold it was keeping me awake. So sometimes I put socks on when I get in bed. Usually JUST as I am about to fall asleep, I pull them off. Well, this is in the winter, in the summer you know I sleep with ice! Also, use as many pillows and props as you need to be comfortable. I have posted about how I sleep with foam rollers. So use pillows or things to put your body in the most comfortable sleeping position possible. Then even if your mind is still going let your body relax and become heavy. Perhaps imagine all the tension, stress, or busy energy draining out of your body. The times that I have been thinking too much to fall asleep, I have realized that I am tense. Then once I let my body relax, my mind can sometimes follow. Legs up the wall is a great pose to do before bed. If you do that for as long as you can (but at least 10 – 15 minutes) then go DIRECTLY to bed, you might just sleep GREAT! I’ve also gotten out of bed to write down the things I am thinking I need to do. That helped a little bit. I think I posted about that. There are so many things to do that might help. What do you do to help yourself get to sleep when you have a lot on you mind? I have posted about Nia’s 52 Moves. They are moves that Nia has decided to include in the Nia Routines. They are moves that work the entire body. They exercise the brain and the nervous system. As I have explained before they are not moves unique to Nia. Many dance modalities and exercise modalities incorporate them into their practices. It is somewhat like Bikram Yoga in that they have a set number – 26 Postures – that they move through. The moves are yoga moves, but if you were to practice Bikram Yoga (Hot Yoga) you would know which poses you are going to be doing. That is what Nia has done. They have just gathered 52 Moves and we use them in our Routines. Of course, not ALL moves we do in a Nia Routine are part of Nia’s 52 Moves. We do more than just those 52 movements. Sometimes we do other dance moves. Sometimes the movements we do can be likened to actual dance moves. There is one move that we do that I compare to a Pas de Bourrée. Or more accurately what I learned as the Pas de Bourrée. Today one of my students asked me what I was saying and I said it so fast and learned it so long ago I never really thought about it. So I decided to look it up and give it a little attention. After class I was thinking about when I first learned it and it was so long ago I don’t even know where I learned it from. It could have been my brief foray into tap and ballet. I am going to assume so. It seems like I don’t know where I learned things like Kick Ball Change, grapevine, Cha-Cha, and the Pas de Bourrée. I am also thinking that I learned it when I was young because I don’t remember ever researching it. Where I think I would be more intimately familiar with the name had I learned it as an adult. But then . . . I really remember also learning it as a “drunken sailor” so . . . I don’t know. Carlos Aya-Rosas (Nia’s co-founder and the choreographer of the Aya Routine) does not call it a Pas de Bourrée in the routine Aya he actually just puts his feet together then out and that is how he describes it. I instruct it as a Pas de Bourrée. But it is not a Ballet Pas de Bourrée which has one lifting up on ones toes. So that could be why I think of it more as a “drunken sailor”. That visual really helps people do it. Although in some venues that might not be the best of descriptions. It is also like trying to walk on a swaying ship. So as I said, Carlos, brings his feet together then steps out. When I do it I cross my foot behind, shift my weight and come up a little bit on one foot then step out. It is more of a Jazz Pas de Bourrée than a ballet one. So three steps (Jazz) as compare to four to five steps (Ballet), with no pliés or pointes. I am grateful for my students who remind me to revisit things I know, in order to refresh or learn something new. It is somewhat like the beginners mind when I go back and revisit something. I know how I learned to do the step, but it is nice to take it further and learn more about it. Are you familiar with the Pas de Bourrée? Have you taken Ballet? I teach a cardio dance exercise called Nia. But it is more than that. At one point in its history Nia was NIA and stood for Neuromuscular Integrative Action. I have mentioned this before. I have also mentioned that I am not sure why the name has gone through many changes. I personally think that Nia has changed its name trying to find a wide audience. Trying to become more popular. It is sometimes the way with things that there has to be a catchy name or something in order to get people’s attention. Sometimes the name that best describes something is not catchy or marketable enough to attract people. Neuromuscular Integrative Action is really a great name. It describes Nia very well. But I don’t think it is very catching. It is difficult for some to remember, perhaps, and it might not come easy to understand to many people. But it really is a perfect name for Nia. serving or intending to unify separate things. [In] • Medicine — combining allopathic and complementary therapies. So the actions during the workout will have to do with nerves and muscles. The movements, in addition to moving the entire body, also bring together the Body, Mind, Emotions, and Spirit (BMES). So it truly is Neuromuscular Integrative Action. But that truly is a mouthful. Even though it is a great, descriptive name, I think it might have been decided it was too difficult. I don’t know. I am just speculating. I mentioned in my post about Knee Sweeps how it is beneficial to the brain for our limbs to cross over the midline of the body. I want to write a little more on that . . . . imagine you have a string that starts at the top of your forehead and it fall down the middle of your forehead, down the middle of your nose, in between your breast down the middle of your chest, over your belly button, continuing down in between your legs. That is the MIDLINE of your body. So when your cross your left hand/arm or foot/leg over to the right side of that line you are crossing the midline. And vice-versa. This type of action is good for your brain. This type of action is good for your nervous system. It is action relating to nerves and muscles. You use your muscles in action and this stimulates your nervous system. I often remind my class how we are “working” the brain when we cross the midline of the body, when it really is so much more than that. Because, as you know, the each side of the body are controlled by opposite sides of the brain so when you cross the midline both sides of the brain are forced into working. Both sides must communicate with each other. This communication with the nerve-cell pathways linking both sides, but strengthening them. Many exercise classes do this. That is because it is important (I believe I have said this before.) Even yoga does it in some of its asanas. So the crossing does not have to happen in a cardio class or during a cardio exercise. Crossing the midline in stretches also helps “stretch” the brain. So even if you don’t participate in Nia, you can do things to help your brain. But I just wanted to share again – I know I’ve mentioned some of this a few times – how Nia is a lot more than a dance exercise, it really is neuromuscular integrative action. So, with the reminder that it is good for your brain and nervous system, are you gonna cross that line? Recently someone asked me about the Nia Belt system. I pointed him to my original post on Nia’s Belt System. The one where I mentioned having seen many articles back then (in 2009) talking about the belt levels as if people had to progress through them in order to participate in Nia. That is not the case. Nia is a dance exercise. It is a workout. You can go to a Nia class just like you can go to a Zumba Fitness Class, a Jazzercize class, a UJAM class, a Hip-Hop class, a yoga class or any other class where you just walk in and do it. You can just walk in and do Nia. No strings (or belts — tee hee!) attached. Just move your body to the music and enjoy the sensation. Get a workout. Get some exercise in. Dance. The belts are for people who want to learn more. Nia has a “self discovery” program. I don’t want to say self-improvement because some people might think, “I don’t need improving.” and you would be right. The intensives are workshops of about 50 hours that show you how to experience movement in your body, show you how to relate to things. The intensives show you many different things. Each intensive is labeled with a belt color to help distinguish it from the others. I also pointed him to my website which has the belt colors and the focuses of each belt. But I was reminded that the information on my site, from 2012, is not the current information. Nia is always updated herself. She is like the co-creator, Debbie Rosas, she like to be current. Below is the information from 2012. I want to make record of it. Plus I wanted to keep it available in case anyone was interested in remember it and/or comparing it to the newly worded focuses. You can go to my site at Nia Belt Levels and Focuses to see the newly worded focuses and intents for each belt. In 2012 when I put the information on my site there was a White Belt, a Blue Belt, a Brown Belt, and a Black Belt available to anyone. There is now a 1st Degree Black Belt. There is a Green Belt for people who are teaching and have a Nia Livelihood Membership. “Each of the four belts mentioned has a separate set of principles. There are 13 principles for each belt, each belt also has a focus. The focus for Brown Belt is sensing and perceiving energy. The focus for Black Belt is unlimited creativity. When I originally took my White Belt in 2012, the Green Belt was just being created and the original thought was Nia was going to have White Belts that are teaching take it next, before blue. But by the time I had enough money saved up to take my next belt (yes, it took FOUR years) they had relaxed that requirement and now allow people to take the Green Belt when and if they want. I want to take it. However there was a Blue Belt Intensive that was closer and did not require air travel and hotel expenses. So I took the Blue Belt Training prior to the Green Belt Training. Except for the Green Belt there is no testing as in a martial arts type of setting. And the Green Belt test is written. There IS 50+ hours of movement, lectures, thinking, sensing, learning, agreeing, disagreeing, discovering, connecting dots, ah-has, oh-nos, and ooo-ahs. It is incredible and intense. The training that Nia delivers is excellent. My posts about the principles of the White Belt and the Blue Belt can help give you a better idea of what we study in the intensives (at least those two), but it is really something one has to experience for oneself. I hope you click over to my site to see the new verbiage for the focuses and the added intents. **The belt information was taken from the Nia Now website on November 14, 2012. So, I am experiencing one of the oddest situations we have created for ourselves in the world of modern medicine and technology. I am sitting with my mother waiting for her scheduled time to die. I am starting this story for you a little bit backwards, because Tuesday I didn’t have a chance to post. My mother has been sick for a bit and I have been wanting to write about it. I wanted to share plus I am surprised to find it is a bit therapeutic. But I always thought I should ask her before I posted something, but now I feel it is past that point. I came up to be with her on Monday for the day for what we thought would be a procedure that would get her back out in the world and home. But it turned out that the doctors decided that the procedure would be too risky AND it wouldn’t really give us much more time. So they advised us to decide when they should remove the breathing tube that is keeping her breathing. My mother is fully conscious. She has cancer that has affected her throat so she has not been able to eat for probably about a year and a half. She has not been able to swallow well for about eleven months. She’s been spitting into a cup and used a feeding tube. As I said I am telling this story a bit backwards, I will do another post regarding how this all started. I thought I would have time on Tuesday after my Nia class and Yoga Class to type up the beginning of the story so you could get a glimpse of how much she has been through and to end up here is just — I have no words. I started to type it but I didn’t finish and ended up not posting on Tuesday. The cancer has spread to a point that is has basically mangled her trachea. She was in Reno on Friday and in the hospital with a tube in her throat Sunday morning. The tube is a small one they use on pediatric patients. That is the only size they could get down there and it was a struggle at that. One is not meant to live like that. The body will keep fighting it and trying to reject it. And with her body it is really going to try to fight it because her body has already had a severely compromised immune system. So a breathing tube — especially one meant for children — is not a long term solution. When the tube was placed in her throat the idea was that it was going to be temporary — she was in the emergency room on Saturday and the tube was placed in during the wee hours of Sunday morning. The hope was they could put in a stent on Monday. Then, the thought was things could proceed a bit more. There was talk of additional chemotherapy and maybe even more radiation. But the team of doctors met and they were not optimistic. The doctor that would be performing the surgery was very frank and honest in talking to us about the procedure and the miracle that he would have to perform. He said he would do it if my mom said yes. But with the facts in front of her she decided not to have it done. So then her next decision was when to have the doctors remove the breathing tube, the one that is keeping her alive. What kind of decision is that to have to make? I am still just having the most difficult time with someone having to be faced with that decision. Living with a breathing tube that is so small you can hardly get any air and that has to be cleaned out all the time is not for the weak. She can’t talk, she can’t laugh, she can’t cough, and she can’t cry. That is probably the worst part. She can’t cry. The pain is too horrible. She has much to grieve for and she can’t cry. This is just crazy. I am at a loss. I am putting it down because I have to get it out. I am not ready to cry yet because I am pretty sure I won’t stop or maybe I am still just in shock. I had an entirely different picture of what was going on. We are visiting as much as we can. Friends and family are visiting. She is communicating by writing. Sometimes she uses a little white board and sometimes she uses paper. We are not so great at guessing what she is trying to say, so she patiently writes it down for us. She also still has her sense of humor. She is funny. I have found that the outpouring of love from people is really up lifting and very helpful. I have vaguely mentioned on Facebook that my mom was ill and many people have responded with positive thoughts and mentions of prayers. It really is helpful — all of it. To know that people are out there doing what they do when they want to support someone in need is amazing. So I am posting this to help shed some light on my vagueness and to give some of the people who are supporting me (and my family) some idea of what is going on. Now the big thing. The big bad. The ugly. The most important thing . . . . the hardest thing . . . the thing I am typing blindly (I can’t see through tears). . . . can you take a moment out of your day (I know I am asking a lot) on Monday, March 31, 2014 at 1:00 pm to help her on her way? She is a strong, strong woman. A woman who has a lot to live for so letting go might be really difficult for her to do. If there were thoughts and prayers and vibes and ju-ju and love and songs and dances and lights and sparkly stuff to help her let go . . . to help her on the path to the next journey–that would be awesome. The angels will be there too, but I am sure she would love the additional stuff — she always loves a party. Would you do that? 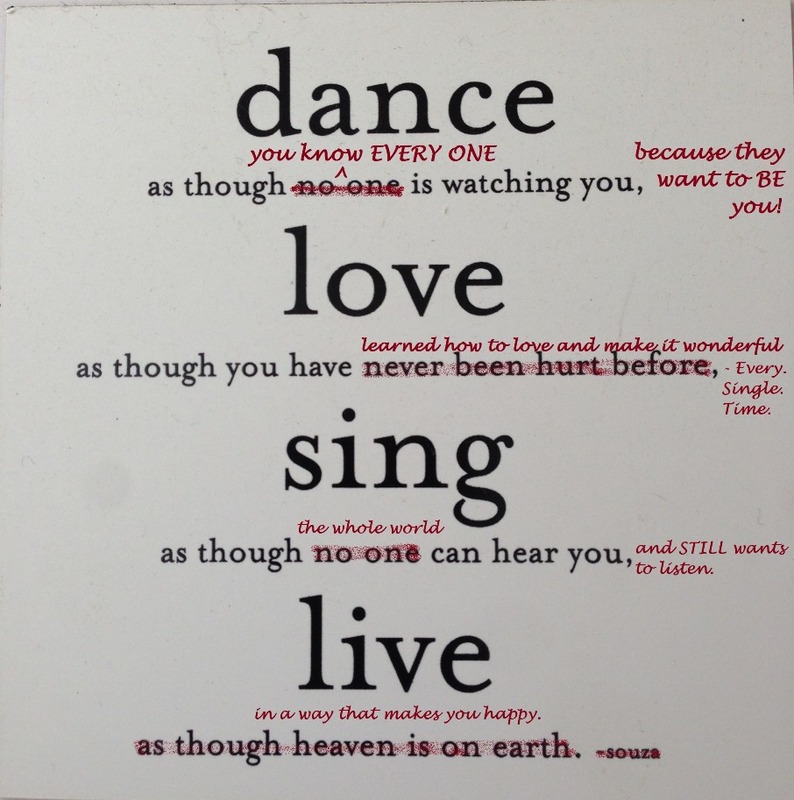 In Nia we have the five sensations that we dance and move with. I always feel that one of them is a personal favorite of one of the co-founders of The Nia Technique. I think that Debbie Rosas really loves stability. I imagine she loves them all because she does a superb job of ensuring they are all included in a each Nia Routine, but sometimes I just get this feeling that practicing balance is her favorite. It could be because sometimes stability, being balanced, requires flexibility and/or agility and/or mobility and/or strength. So you can practice and play with all of the five sensations when practicing balance. In yoga there is at least three of the five sensations we experience in Nia. In yoga there is flexibility and/or strength and/or stability/balance. In the Gentle Yoga class I am teaching I really like to put a huge emphasis on balance. I think balance is very important and yoga is a great way to practice it. There are many poses in yoga that are balance poses. Not all of them are standing poses. One pose I really like to use for enhancing balance is the Gate pose. This pose is a kneeling pose, somewhat. In the gentle yoga class we start on our knees. Up off our calves, as in we are not sitting on our legs. Then we lean forward and over to one side, say the left. We lean forward to the left placing both our hands on the ground in front of the left knee. Then we swing our right leg out so it is pointed out to the side. The heel of the right foot is aligned with the left knee or slightly in front. The right foot is flat on the ground and the toes are pointed away from the body. We then lift up so we are kneeling on our left leg with our right leg posed out to the right of our body. Then the left arm comes up reaching straight over the head. Palm towards the right. The right hand is palm up resting on the right thigh. If stability and balance is achieved then those that are comfortable lean over to the right, allowing the right hand to rest lower on the leg, at the shin, not the knee. If comfortable we turn the head to gaze past our left arm. All the while the crown of the head is moving away from our body and the tail is moving in the opposite direction. We are lengthening our spine. The shoulders are being drawn back and down. Even though one arm is up we still keep the space between the ear and the shoulder open and large. The same with the side we are leaning towards. Whether you are staying up right or leaning over to the side, keep your body from leaning forward. Stay in the pose for a few breaths. After you perform this pose on one side, do the other. Parighasana, the Gate pose, is a nice way to pursue balance. The foot that is out can be adjusted to a parallel (to the body) position if that allows it to be more comfortable or stable. Or the foot can be lifted leaving just the heel on the ground. The depth of the side bend is always a point that can be adjusted for the individual’s needs at the moment. I love all the poses in yoga that allow for balance practice. I think this is a great post with which to practice balance. Are you familiar with the Gate pose? Do you like this pose? I have allergies. I’m allergic to things outside, things inside, and things around. I cannot breathe through my nose at night especially when I sleep. My nose gets too stuffed. When my mouth hangs open all night long it gets dry and my throat hurts. So I sleep with a cough drop in my mouth. This does a few things, sometimes it helps a little with the “stuffy”, it helps sooth my throat, and/or it helps me keep my mouth shut which is great because I don’t even want to think about . . . . (spiders, shhhh!). Not too long ago I was doing a quick stop at a shop after one of my Nia classes and I saw that there was a bag of cough drops on sale. They were honey-lemon. Whatever . . . I was hoping they wouldn’t be to icky. Turns out they weren’t icky at all. I liked them. So the next time I was in the store they were still on sale so I bought two bags. I was using them when halfway through one of the bags I actually looked at one of the wrappers. Well, I’ll be . . . 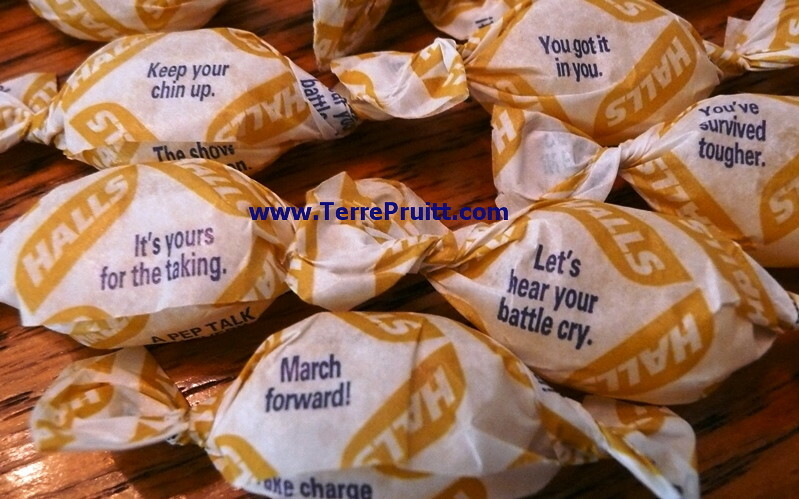 I was happily surprised to see little motivational sayings on each wrapper. How cute is that? 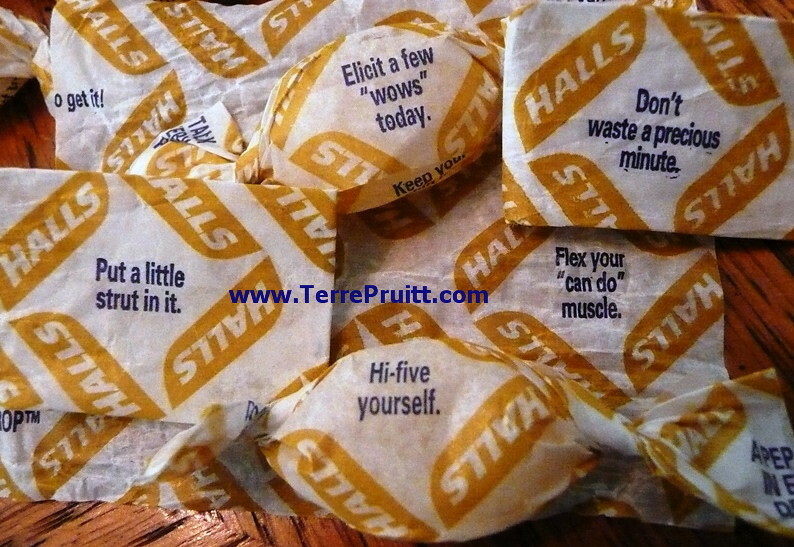 Halls has a PEP TALK IN EVERY DROP™. I think that is pretty brilliant. It made me smile. Then I was thinking that most people use cough drops when they are not feeling well, so these could really be little pick me ups. I know there are tags on some tea bags that have nice little sayings, I’ve seen that, but I hadn’t noticed the sayings on the wrappers of these cough drops right away. I like it! ~Put a little strut in it! ~Elicit a few “wows” today. ~Don’t waste a precious minute. ~Don’t wait to get started. ~Flex your “can do” muscles. You know that I would LOVE the strut one. To me strut is like “spirit” or “pep” and I like putting that into it! Strut into the dance of life! And, really, who wouldn’t want to elicit “wows”, right? Well, I guess there are some “wows” out there that are a result of some odd things, but I am thinking of the of positive masterful “WOWs”. Those two are my favorite of my favorites. Such a simple thing for a company to do. I know — as I said — they are not the only ones to do it nor, I imagine, the first ones to do it, but I still think it is cool. Sometimes it is the little things. Ha, and speaking of little things, the latest bag I bought . . . the cough drops are SMALLER than they used to be. Sigh. Don’t you think this is a nice idea? Which saying would you pick as a favorite? Whether you do Nia, Zumba, yoga, Pilates, country western dance, motor-cycle race, play tennis, or just about anything there are the “Gods” or celebrities of the practice/dance/sport. Often the “Gods” or gurus are the masters or the top teachers, but sometimes it is the CREATOR himself/herself. That is when the event is really rockin’. That is when the events sell out or get so crowded it is crazy. Well, Nia is going through a lot of changes and they have been working for a couple of years training the top instructors to move up even further to become top trainers. The male of the male-female combo that created Nia, Carlos AyaRosas (FKA Carlos Rosas) retired a bit ago, so that left the female creator to continue on. She is coming to the San Francisco Bay Area . . . . . which is a rather large area. She is going to be in the North Bay, the East Bay, and the Peninsula. And it is going to be rockin’. She and a top trainer are going to be here. Debbie Rosas is the (co-)creator of Nia. Kevin VerEecke is a Nia Trainer. They are going to be in the San Francisco Bay Area in the beginning of April (2013). They are going to have seven classes. It is going to be incredible. Every thing has its superstars, its celebrities and these are ours. It is really exciting. I took my Nia White Belt Intensive at the Nia Headquarters in Portland. The trainers doing the intensive were Debbie and Carlos. Plus they were here for a “Spirit of Nia” tour within the last four years. So I have met them both. I have never met Kevin. I am excited that Debbie and Kevin will be here sharing the Nia experience. The classes that they are going to be doing are 52 Moves classes. While we have a basic set of 52 Moves we don’t typically do all 52 in every Nia Routine. We do many, but not usually all. In these classes they are going to lead us through all 52 Moves. There are going to be seven chances to check it out. The first class that will be held will be with Keven VerEecke only in San Rafael. Then Friday’s classes, Saturday’s Classes, and Sunday’s Classes will be both Debbie and Kevin. The flyer indicates that all classes will have a different playlist. I guess for some people that is important. I know Nia enough to know that all seven classes could be the same EXACT playlist yet all seven classes could be totally different. That is the beauty of Nia. And with two masters leading the dance it wouldn’t matter. BUT . . . the flyer does indicate all classes will have different play lists. I hope you will take this opportunity. Nia is always fun, but when you have the creator up in front of a room full of people who are there to dance, move, and have fun there is no way you can experience anything but MAGIC.